”Have you ever seen such a big interference in nature?” asks Natalia pointing to a muddy road wider than an 8 lane motorway slicing through the forest as far as the eye can see. Workers surrounded by a variety of heavy machinery are in full swing welding slowly closer to China. Observing the sheer scale of this small section of 3,000 kilometre pipeline Natalie adds, "Economic growth always takes place before thinking about the consequences in Russia." Journalist Natalia Kuzmina writes for a newspaper in nearby Neryungri . Outside the coal mining city Transneft, Russia’s state-owned oil pipeline monopoly are building a 3,000 kilometre pipeline to shift the black gold cheaply from the World's biggest oil producer Russia, to the biggest user, China. Transneft are responsible for the national oil pipelines transporting 93% of oil produced in Russia. The company pump crude oil through a 48,000 kilometre network of pipelines stretching from Eastern Europe to Asia. This part of Transneft's extensive network will transport oil from western and central Siberian oilfields to the Sea of Japan, where a terminal will be built on Amur Bay, home to the remaining population of 30 Amur leopards. When the full project is ready in 2014 the pipe will be 4,700 kilometres long and will transport 15m tonnes of oil each year, approximately 300,000 barrels a day. Adding the above figures to the increasingly unstable ground outside of Neryungri, Natalia’s concerns seem immediately validated. If the permafrost continues to melt there is a great risk the construction will become unstable and break. 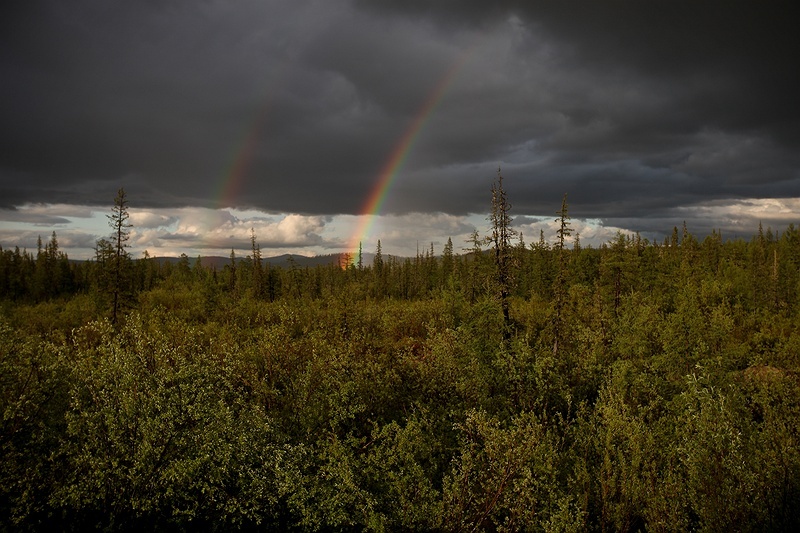 "Oil in the sensitive taiga environment would simply be a catastrophe," says Natalia. It is impossible not to notice the signs of the ground becoming unstable. Trees that once grew upright, with roots held firmly in place by a thick layer of permafrost are dead in ghostly pools of melt water. This phenomenon is known as "drunken forest" and is a common sight around Iengra as thermokarst lakes are increasing. 90 percent of the 1,300 people living in the small nearby village are indigenous people called Evenks. Their life traditionally is based on reindeer herding, winter hunting and summer fishing, harmonized within a sustainable cycle. Traditionally very similar to the tribes in Yamal Peninsula . In a little local museum teacher Tatiana Seminova who has lived here since 1958 is an authority in the local area and culture. “Today not all Evenks live this way of life, but some still try to”, she says. These northern people have, just like the Nenets, sustained their way of life in tight interaction with nature. Therefore any changes in the climate system and natural world are felt acutely by them. "Wild reindeer migration routes have changed because of the warming climate, and the same happens to domestic reindeer herding tracks. There are also more wolves nowadays searching farther for food, intensive snowstorms with immediate melting afterwards and more cases of drunken forest as the ground melts," says Tatiana Seminova. The lessons here are that these communities have already been affected by climate changes. If people don’t listen to those who know the landscape intimately then there will be as Natalie said, ’consequences.’ If climate change causes permafrost collapses under the pipeline, not only will there be severe economic damage to the oil suppliers, pipeline companies and consumers, but it will cause irreparable damage to local communities and the environment it is built on.